A spectacular view of Muizenberg beach taken from Boyes Drive. Back in the 1600's Muizenberg belonged to the Khoi people or bushmen as they were also known. The Khoi were cattle farmers and they grazed their cattle in the area. In 1670 the Dutch East India company who were in control of the Cape then took over the area around Muizenberg and established their own cattle farm. The reason being that passing ships had to be replenished and one of their requirements was meat. 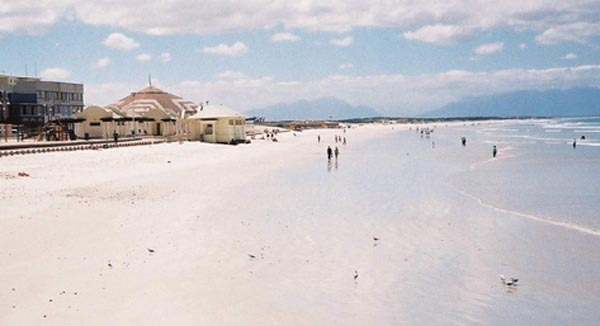 Muizenberg got its name in 1743 when it became a military outpost under Sergeant Wynand Muis . It was called Fort Muys. This name eventally evolved into the current name of Muizenberg. Muizenberg has much to offer visitors. 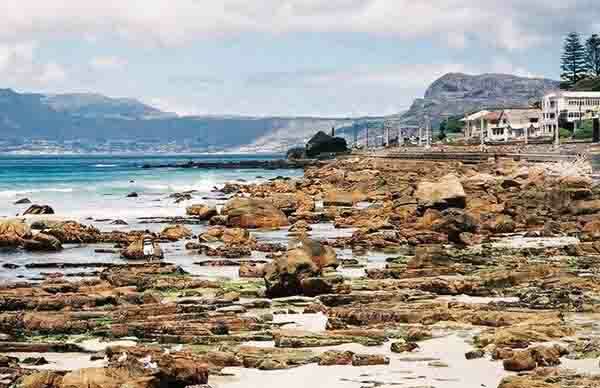 Firstly it has its beach which is 36 kilometres long and stretches all the way along the False Bay coastline to the Hottentots Holland mountains in the east. The beach has different names along its length, starting in the west, we have Muizenberg Corner, Sunrise Beach, Strandfontein, Monwabisi and many more the further east you travel. Muizenberg corner is a favourite surf spot and when the surf is working you will be hard pressed to find a spot on the waves there. What makes Muizenberg corner so popular is that it is safe for beginners as well as more experienced surfers. It has swells that roll in from the Indian Ocean and that are surfable from quite far off shore. This allows surfers a long ride when they catch a wave. Of course, if they fall off they have a mighty long swim back to the beach to retrieve their boards. The modern surfers have got wise to that though and attach their boards to their ankles with a rubber harness. In the summer months the surf is blown out more often than not by the gale force south east winds which howl across False Bay.When this happens surf spots such as Long Beach in Kommetjie come into their own. Muizenberg is well known for its architecture and Museums. The oldest building being the Het Posthuys which was built in 1670. A number of old buildings such as Rhodes Cottage and the Natalie Labia Museum are to be found on the mountain slopes along the main road to St James. These buildings have been turned into Museums and are open to the public daily. Another building of historical interest is the Muizenberg railway station which has recently been upgraded and now has a number of small shops in it. This has brought back some life to a once dead area of town. Muizenberg is well known for its views. 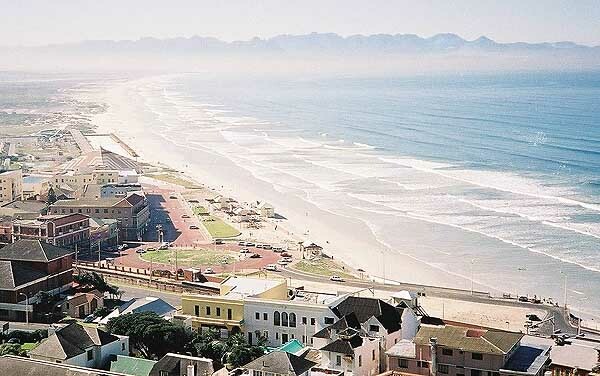 Take a drive along Boyes Drive and look down onto the Muizenberg beach from above. The view of the sea breaking onto the pristine beaches is spectacular. About a kilometre along the beach eastwards from Muizenberg corner is the Muizenberg Pavilion. Here one can stroll on the pavilion and look down onto the beach. To the north of the pavilion is an entertainment area with a waterslide and a putt-putt course for the kids. It is very popular when the wind blows one off the beach. At the eastern end the pavilion is a canal where Zandvlei enters the sea. It is normally closed to the sea in summer and forms quite a nice swimming area for small kids to swim in. In the winter months the lagoon becomes a tidal zone when the storms break through the sand barrier at the mouth and open it to the sea. The Zandvlei lagoon offers good fun for kite and windsurfers and for canoeing. Anglers can also catch fish in the lagoon. Sunrise Beach is well known for its “Trek “fishermen. They watch the sea for signs of fish and when they see a shoal close to shore rush out with their long net and drop it behind the shoal of fish. They then pull the net back to shore by hand and pull in the unfortunate shoal of fish in the net. the moment there is much talk about this type of fishing as everything that gets caught in the net dies. Many undersized fish get caught and this wreaks havoc with the breeding stock of especially the endangered fish. Anglers have to have licences to fish off the beach with rods and are curtailed in the number and size of fish they may catch. These guys come along and catch everything irrespective of size and quotas. To the west of Muizenberg are the mountains. They are very popular with hikers as they are not too steep and offer spectacular views over False bay. Above Kalk Bay, a short distance from Muizenberg, there are a number of caves to be explored . They are quite exciting for those people who are interested in crawling around in the dark on their stomachs. As you can see this part of our coastline has much to offer and is very popular with visitors .